We own a 1983 Defever 44. 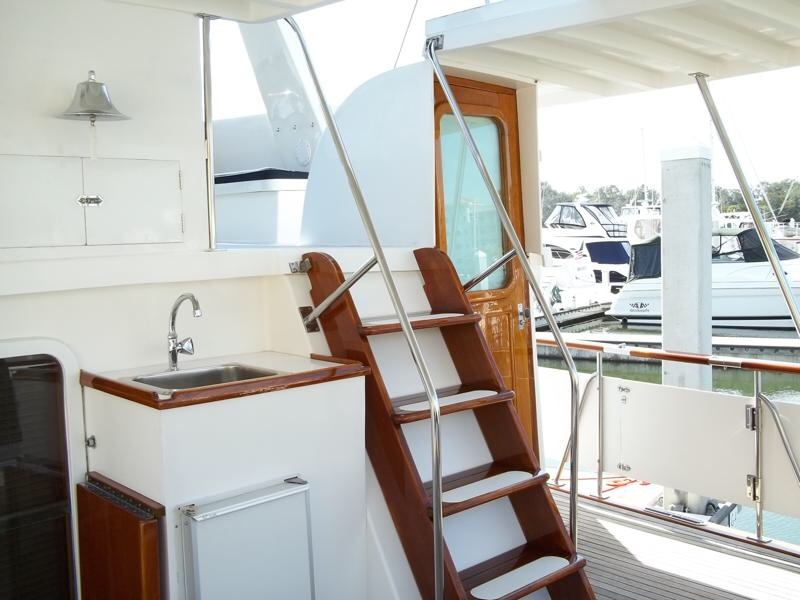 The grab bar that failed is the one that is used when descending the ladder from the fly-bridge to the aft deck. Our 12 year-old granddaughter (90 lbs.) swung on it like a monkey bar and it broke off in her hands. She crashed to the aft deck landing awkwardly. She broke two bones in her ankle cleanly requiring surgery to put it all back together. The purpose of this posting is to warn others. The bar itself is steel and is not the problem. The mounting brackets, however, were made of pot metal, sometimes also known as white metal. Exposure to the elements for 33 years corroded and weakened the brackets such that they failed under a modest load. If there are any Defever owners with this model of grabar (or owners of other boats with this type of bar), I urge you to consider replacing it immediately even if the bar is not very old. ooooh! We wish your granddaughter a speedy recovery. And thanks for the reminder to check grab bars. Mine are all painted teak, so they are somewhat difficult to check the condition. We're wishing her a speedy recovery. I could so see my kids (or me many years ago)having done the same thing! Although it wasn't built to swing on, the builder should've assumed that that would one day be the case. That chrome zamak junk has no place on a boat other than the lightest-of-duty fresh water craft. When only 15 years young, the mast base, made of the same ugly pot metal failed under load. Luckily the only thing held up at the time was a Sabot. All 8 ft and 50 lbs of it. Check your boats for a hidden hunk of "white" metal. Get rid of it. My replacement is made of 1/4" stainless, is now 17 yrs old, has held fast while lifting 300 b without pause. Why it was not built properly in the first place???? Good advice, sorry about the granddaughter. I don't think there is such stuff on my CHB but I will look. I always tell people to never trust any railings on any boat, your life may depend on it. Here's wishing the best result to injury healing! Thanks for this very important safety reminder. I'm sure it will assist reduction in accidents on some boats. Sorry for your granddaughter and an important safety consideration all of us should seek to address. That`s a very helpful heads up in the best TF tradition, thanks. Wishing your granddaughter a speedy recovery. Pop metal and die cast zinc go hand in hand. But not on a boat in a corrosive seawater environment. Unless of course for anode use where they are destined to rot away..
Cheesh, Jack. What a tragic boat lesson, although I guess it could have been worse. No pot metal that I know of on my boat, but I'm passing on the warning to everyone. Best to your granddaughter for healing. Thanks for the heads up. So sorry it was at your granddaughters expense. Anyone that puts pot metal on a sea going boat should be dope slapped. That stuff is crapola. Must have been scary to witness a fall like that, CJ. Glad your granddaughter's injuries weren't worse. Thanks for the heads up. I removed two grab bars from our upper helm area that were little more than cheap bathroom towel bars a PO had installed. Which makes me wonder if your grab bar was factory or PO-installed. We don't have one on our '87 DeFever 44, just two stainless railings with stainless fittings leading from the sun deck to the flybridge. Thanks for this very relevant heads-up. I wish your granddaughter a quick recovery, and I hope this accident doesn't shake her confidence and joy in being aboard Catalina Jack (or any other boat). You can buy zinc diecast (pot metal, white metal) fittings lots of places. Don't! You can buy cast stainless steel fittings in similar patterns. Even if made in China, they're likely to be better. I don't know what the science is, but there is a wide variety in quality of these chrome plated diecast objects. Some do well over time; others seem to melt away. Interesting to compare the lovely chromed zinc grilles on Studebaker Hawks with other chromed zinc trim on the same car; same cost-stressed manufacturer, presumably different subcontractors. Some zinc diecastings are prone to warping and shrinking before they fall to pieces; the transmission frame and the control switches in Ampico reproducing pianos will need to be replaced with aluminum or brass castings when the piano is restored (but a piano action's frames will be fine). Best of wishes for the young acrobat! Architectural codes for strength are pretty specific for hand- and grab rails - 200lbs in any direction. Boat rails ought to be at least as good. Thanks for the heads up and wish your Grand daughter a speedy recovery!!! Another hand hold story. When we were younger and crazier, we went out for a boat ride at night on Galveston Bay. It was on my friend's Fales trawler. There are no lifelines or railings. But another friend was standing on the side deck. He thought it would be "cute" to try and get the boat rocking. He was in the 250-300lb range. So he grabbed the cabin top teak hand rail and proceeded to start rocking the boat. Being a 30 foot round bilge trawler he did get it rocking. But the teak hand rail broke off in his hand and over he went. Nothing like MOB at night. The person at the helm was NOT the owner and did not understand the importance of the situation. For some reason he kept going straight instead of stopping the boat and or turning around. Anyway, it was a clear night with about a 3/4 moon and we were looking straight into the moon glare that illuminated our MOB and we were able to see him and pick him up. Even if we had failed I think he would have survived. There was one person in the aft cockpit that did understand the seriousness of the situation and threw every single PFD in sight...so it was a "yardsale" of type 2s and type 4s. He at least would have had a flotilla of PFDs. Watch for painted aluminum fittings too, if you see any bubbling or blistering of the paint, the underlying metal is disintegrating. Hope your GD has no lasting effects, get well! Zinc alloy has no place in a quality boat. Anti-corrosion "zincs" not intended to be included in the above opinion, just chrome-plated topside fittings. Mr Angus in post 13 pointed out it's not only a factory problem but possibly a cheapskate previous owner. A casual unsuspecting glance may not pick up on it but am willing to bet a couple hundred boat owners are going to give their grab bars a good tugging and inspection on the next boat trip. I can see poor fasteners or deteriorating mounting material on a high quality rail yielding a similar result. Check 'em at the dock when you don't need them rather than in a seaway when you do.